Tom graduated from the University of Massachusetts – Lowell with a B.S. in Exercise Physiology in 2011 and a Doctorate in Physical Therapy in 2018. 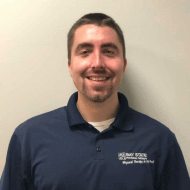 Tom completed his second clinical education experience with Bay State Physical Therapy in August of 2017 and returned to Bay State in December of 2018. Tom’s clinical experience includes acute care physical therapy in which he treated patients with various conditions such as congestive heart failure, multiple sclerosis, stroke, and acute post-op total joint replacements. Tom has seven years experience working as an EMT-B mostly in Lawrence, MA where he has developed medical proficiency is Spanish. His clinical interests include special interest in the treatment of shoulder and back pain as well as the use of manual therapy, therapeutic exercise and patient education. In his spare time Tom enjoys dancing salsa with his wife. He enjoys playing sports and cheering for New England sports teams, especially the Patriots and Celtics.